Robert D. Kaplan is one of our leading international journalists, someone who can explain the most complicated and volatile regions and show why they’re relevant to our world. In Surrender or Starve, Kaplan illuminates the fault lines in the Horn of Africa, which is emerging as a crucial region for America’s ongoing war on terrorism. 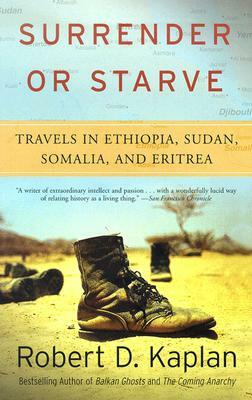 Reporting from Sudan, Ethiopia, Somalia, and Eritrea, Kaplan examines the factors behind the famine that ravaged the region in the 1980s, exploring the ethnic, religious, and class conflicts that are crucial for understanding the region today. He offers a new foreword and afterword that show how the nations have developed since the famine, and why this region will only grow more important to the United States. Wielding his trademark ability to blend on-the-ground reporting and cogent analysis, Robert D. Kaplan introduces us to a fascinating part of the world, one that it would behoove all of us to know more about.